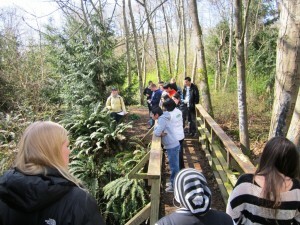 On June 11, 2012, at Renton City Hall, Feet First was one of five organizations to receive a 2012 Puget Sound Champion Award by the Puget Sound Partnership and Leadership Council for its Watershed Walks Program. Awardees are nominated by their peers in recognition for their outstanding dedication to the goals of the Puget Sound Partnership’s Action Agenda. Environmental education works best when people can relate issues of global scale to their own backyards. To that end, Martha Kongsgaard, Chair of the Leadership Council highlighted Feet First as an “engaging” and “informative” organization and said that the “block-by-block,” community-based approach can “get where the policy can’t” toward a more “walkable, livable direction” for Puget Sound. The Puget Sound Champion Award recognizes Feet First’s work developing a Watershed Walks program, which consists of a series of walking tours by trained Neighborhood Walking Ambassadors in watersheds that are critical to the health of Puget Sound. The walks emphasize what residents within watersheds can do to help their local environment, while getting more people out walking in their neighborhood. 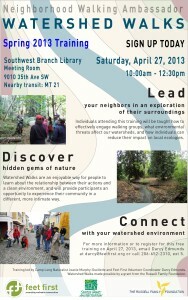 Feet First’s Watershed Walks Program with support from the Seattle Parks and Recreation Camp Long, and partial funding through the Mountaineers Foundation recruited and trained Neighborhood Walking Ambassadors, community volunteers who educate residents about the natural ecology of the Longfellow Creek Watershed in West Seattle. Tailored to the specific natural ecology of their own neighborhoods, the Watershed Walks bring environmental values home to people, fostering awareness of the public’s shared stewardship of our fragile surface waters. The other organizations that received Puget Sound Champion Awards include: King County, Totem OceanTrailer Express, Kristen Williamson and the Green Shorelines Steering Committee. To sign up for an upcoming Neighborhood Walking Ambassador training, contact Feet First by emailing info@feetfirst.org or calling 206-652-2310 ext. 5.